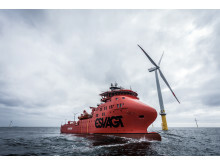 The rescue operation in the Barents Sea brings ESVAGT the safety award from ENI. 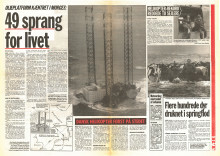 The successful rescue operation brought ESVAGT acclaim throughout the entire North Sea. It was one of the reasons why ESVAGT was awarded the Leith International Conference’s Offshore Safety Award i 1991, and to this day the operation is close to the heart of not just ESVAGT but to the branch in general and in Norway in particular. Kaj Emanuel Kristensen was boatmaster on the Fast Rescue Boat that saved the 40-year-old man from the water. Valentin Markussen was ordinary ship's assistant on the boat and Ivan Nørskov was the experienced AB.